In the following instructions, "fire" refers to the space bar and can also refer to either of the buttons on the joystick and mouse. To exit the title screen, hit fire. A text sequence (see below) displaying the game's credits will begin when the title screen is exited for the first time. After this, the title screen will only displayed after the game is "won" or after the ESC key is hit during a game (see below). It will be skipped after games in which the player "loses". The title screen will also fade off when the title music has finished playing. Hitting Control (Ctrl) and Q simultaneously will quit the game. The title screen will fade off the and the program will exit to DOS. At various times in the game, namely, the credits, before a level and after a game, a text sequence will begin unless skipped (see below). To skip one of these text sequences, hit fire.а The sequence cannot be skipped for the first half second of running, to avoid accidentally skipping a sequence.а An audio sample will be played when the text sequence begins to fade off, either when skipped or when finished.а This sample will be played through the Sound Blaster if possible, with maximum quality, or through the IBM PC internal speaker if the current sound device is that speaker or the Adlib sound card, with a "subtitle" appearing, to describe the sound. Hit P to pause a text sequence, and P again to unpause it. Hitting Control (Ctrl) and Q simultaneously will quit the game.а The screen will fade off and the program will exit to DOS. At the beginning of a new game, a menu will prompt the user to choose the Difficulty Level: Novice or Expert.а The Novice level gives the player infinite chances, or "lives", in which to complete the game, while the Expert level gives the user three lives.а In both difficulty levels the player begins a new "life" from the approximate location that they were destroyed at. To control the space-craft with the keyboard, hit the directional key on the numeric or arrow keypad in the direction that you wish the ship to go in.а The space-craft can also move diagonally by hitting two directional keys at once, or by using a "diagonal" key on the numeric keypad. With the joystick, simply move the stick in the direction which you want the space-craft to travel in. When using the mouse, an on-screen pointer will appear.а The ship will always travel towards this pointer, "chasing" it.а The ship will cease "chasing" the mouse pointer once it reaches it, so that you may control the ship with the keyboard as long as you don't move the mouse pointer after the ship has reached it. To shoot, hit fire.а Rapidly hitting fire will cause the space-craft to shoot more quickly than simply holding in fire. Shots can not pass through the red remains of an alien. When playing on the Expert Difficulty Level you will have, initially, three "lives. "а Each "life" is another attempt to continue in the current game, starting on the screen where you got out.а You will be given an additional bonus life if you finish a level. When playing on the Novice Difficulty Level you will have infinite lives in which to complete the game in. The escape key will end the current game.а The screen will fade off and the game will return to the title sequence. By hitting the ENTER/RETURN key while the screen fades off slowly, either after hitting ESC, dying (by losing all your lives) or winning the game, the losing sequence, if it was to be played, will be skipped and a new game begun immediately. By hitting the Control (Ctrl) and Q keys down simultaneously, the screen will fade off and the program will exit to DOS. By hitting the T key the outer scrolling regions will be Toggled (switched) on or off. Users of slower computers may wish to turn off these additional scrolling regions at the top and bottom edges of the screen to speed the game up. By hitting the S key the game Sound effects will be toggled (switched) on or off. 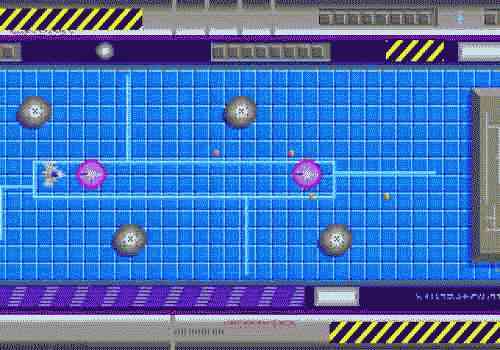 The aim of the game is simple: make it through the game while dodging or destroying the alien space-craft and "bombs" which spray from certain objects on the screen. Then destroy the end of level alien, a type of guardian of the alien ship, to advance to the next level. It isn't easy, but sharp skills and fast reflexes will serve you well.